I signed up for Kate Johnson's Visual Journaling Class and I'm trying to focus my sketches on my daily activities for several weeks. 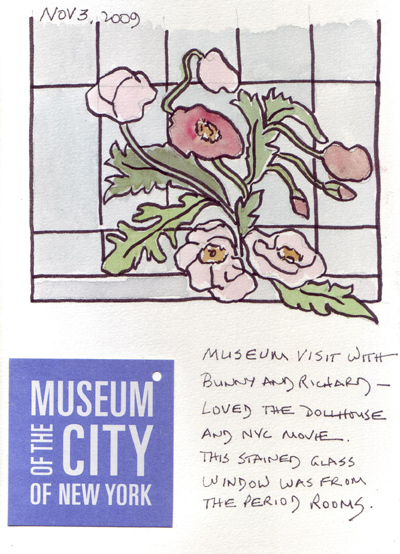 I sketched and painted a detail from a beautiful stained class window at the Museum of the City of New York during a visit there this week. The following day we took care of our newest grandchild and I sketched his "lovey" - a British Jellycat animal called Scrumpty Elly. My daughter-in-law takes his picture with this animal every month to see Zach's growth. 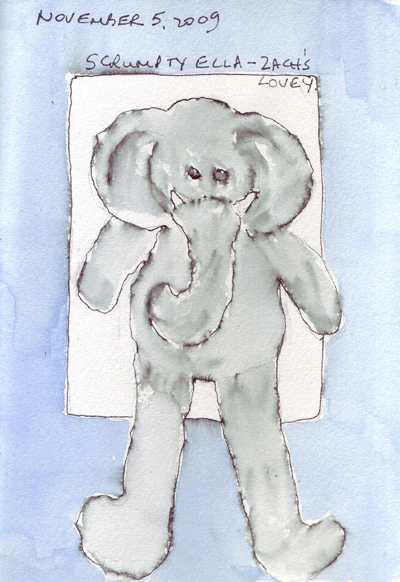 I sketched him with my non-permanent Varsity pen and then just wet the elephant to create the color. 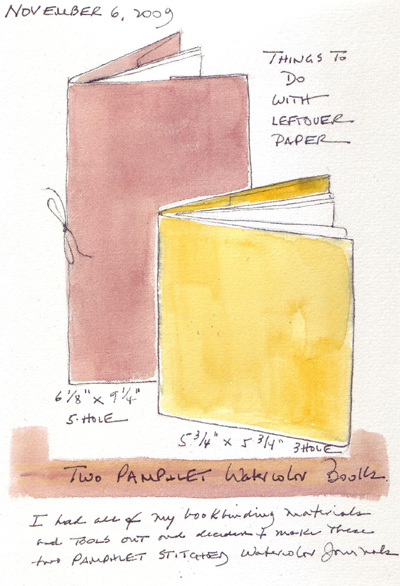 I made two new codex watercolor journals this week, and while I had my bookbinding equipment out, I made two watercolor pamphlet style journals with waste watercolor paper from a few recent recycled books. One of them is a gift for a friend, the other may be the perfect watercolor booklet for my grand daughter. 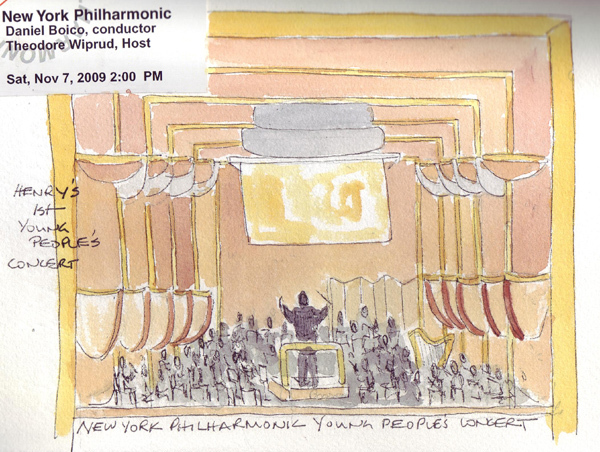 Today we took our oldest grandchild to the New York Philharmonic Young People's Concert and I had approximately 10 minutes before the lights went down to quickly sketch the stage. Henry and I talked about the colors so I could remember them until I got home. Here are 3 more journal pages - I'm on a roll! I love watching Project Runway and periodically like to sketch the winning design the evening that I watch it. 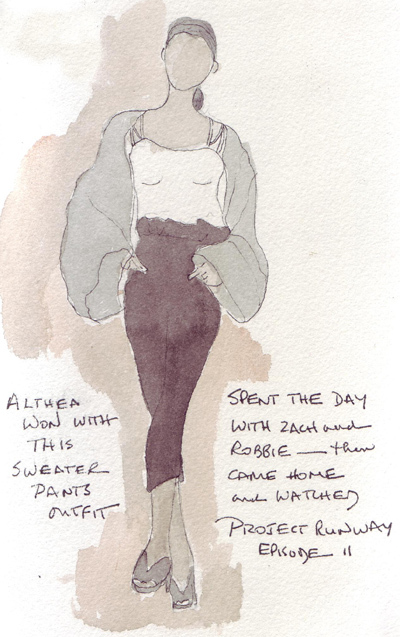 Here is the oversized sweater and paper-bag waste pants by Althea that all of the women judges wanted to wear, right then. The following day I thought alot about my own love of design and specifically two outfits that I made when I was a senior in college. The one on the left is a suede suit that I made with 5 skins that my boyfriend of the time gave me for my birthday. I had enough suede to make the skirt and front panels of the jacket. The jacket sleeves, back, and front button panel were made from a wool-silk tweed blend that matched the suede. The dress on the left was made as a final exam in a semester long flat pattern design course that I took (after my premed requirements were done and I was already admitted to medical school). 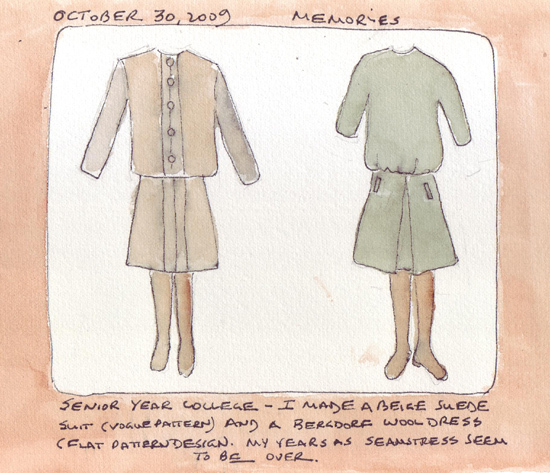 I selected a dress from a NYTimes newspaper advertisement and made the pattern and then the dress from a green wool tweed. The top was a blouson style and the skirt had a deep inverted pleat and slant pockets. I don't have photos of either design - amazing now that I have 10 photos of everything with my digital camera. Yesterday my husband and I went to the Fall Impressionist and Modern Previews at Christies and Sotheby's Auction Houses in New York City - one of our favorite semi-annual activities. We start at Christies, then have lunch at Dos Caminos and end at Sothebys - and in the process see well over 500 pieces of art that will be auctioned on Nov 3rd and 4th. 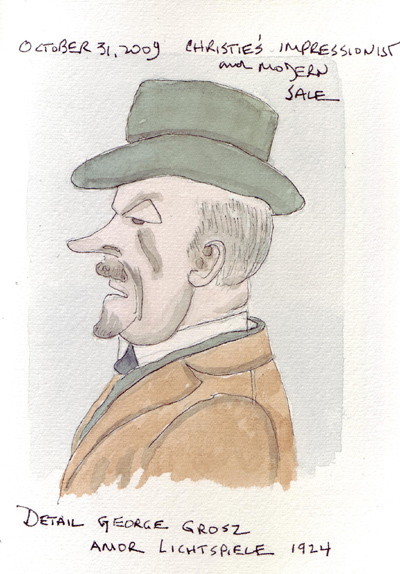 I loved a work on paper by George Grosz and sketched a detail from it - a man's head. 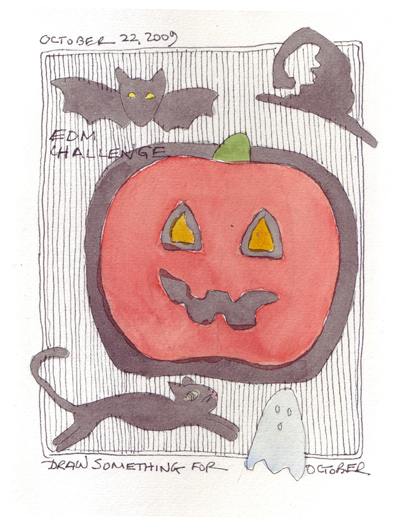 I don't know what number this EDM Challenge is - #245 or 246 depending on whether the Free Choice last week was assigned a number. I did several "play" exercises before I left last week for the Quilt Festival. Prepainting a Page Background: Roz http://rozwoundup.typepad.com/roz_wound_up/ recommends prepainting the background on some pages in your sketchbook and then just drawing and painting over it. I prepainted every other double-page spread in my first sketchbook (2003) based on exercises derived from the Gwen Diehn book The Decorated Page, but have not done it since. 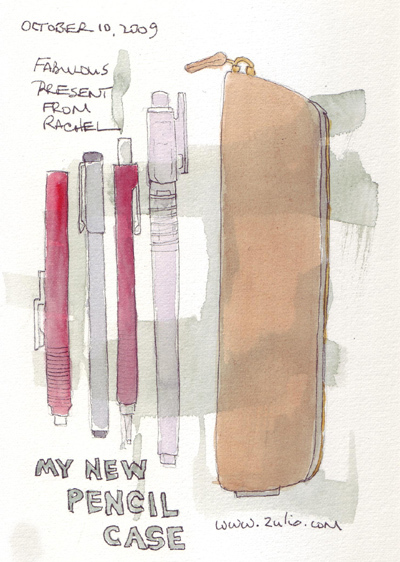 My daughter found a new leather pencil case for me and I wanted to draw it with one of each category of tool I carry in it. To make the background more interesting, I decided to prepaint it, let it dry, and then proceed with my drawing. 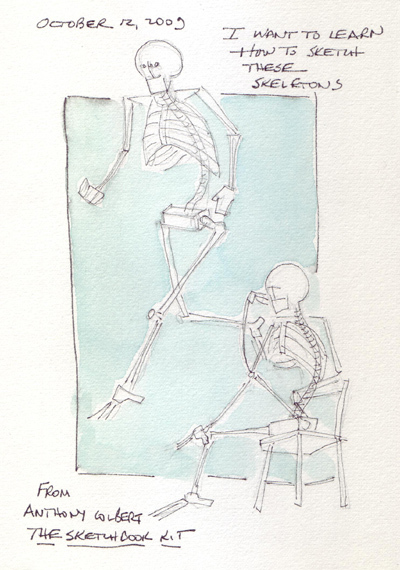 Anatomy for Action Figure Drawing: Angela Gair and Anthony Colbert, in their book The Sketchbook Kit, recommend that you "amuse yourself by drawing little sketches that show how the skeleton moves, in order to understand how the joints operate." I love this concept and finally tried drawing their little skeletons, just in time for Halloween. I use Procion MX dyes to "paint" cotton and silk and keep the primary color stock solutions (plus black) in the refrigerator - tightly capped and way in the back on a bottom shelf. I made this batch two years ago and put them away to use again. But for a variety of reasons, I haven't dyed another piece of cloth since then - and forgot about them. I'm off to the Houston Quilt Festival tomorrow morning, to learn more surface design techniques and have a mini-vacation. This is the 35th anniversary of Festival and my 25th year as a registrant. My sketchbook will go with me and hopefully I'll at least have some sketches of conference participants in their colorful clothes when I come home.